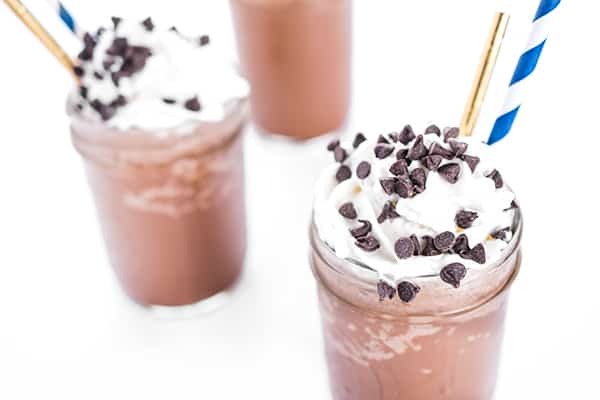 Once you see how easy it is to make a rich and creamy Starbucks Mocha Frappuccino at home you’ll never miss the fat and calories you’re saving. Coffee and chocolate are a flavor match made in heaven which is why it is no surprise that the Starbucks Mocha Frappuccino is so popular. Cool, creamy, rich and chocolately – what’s not to love? Confession: I’ve never actually ordered a Frappuccino at Starbucks before. While there are many unhealthy foods I can’t resist, Frappuccinos fall into my “off limits” category which means I never order them. The same can be said for a McDonald’s Big Mac, General Tso’s Chicken at a mall food court or a donuts from Dunkin’ Donuts. It all goes back to my 80’s childhood during the fat-free craze followed by my overweight adolescence in the 90’s/00’s. I didn’t grow up eating these heavy foods so to eat them now would pretty much be a guaranteed stomach ache. Psychologically, consuming them would immediately bring me to a dark place so for these reasons, I avoid them. The fact is, I’ve worked too hard to achieve weight loss success and I’ve also learned a lot about making smarter food choices over the years. 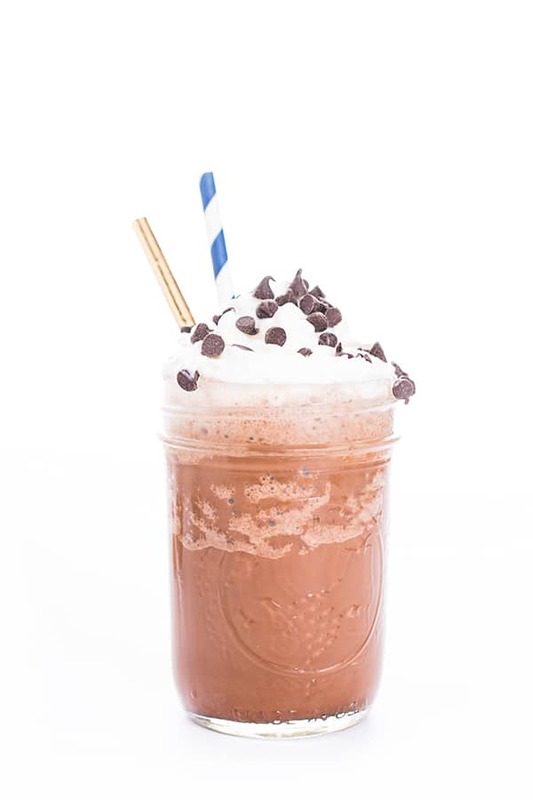 By using ingredients I can pronounce such as cocoa powder, half and half and strong coffee plus a few drops of my favorite chocolate stevia, I end up with a frothy, decadent frozen drink that is sheer perfection. If you don’t have liquid stevia, honey or pure maple syrup work just as well. 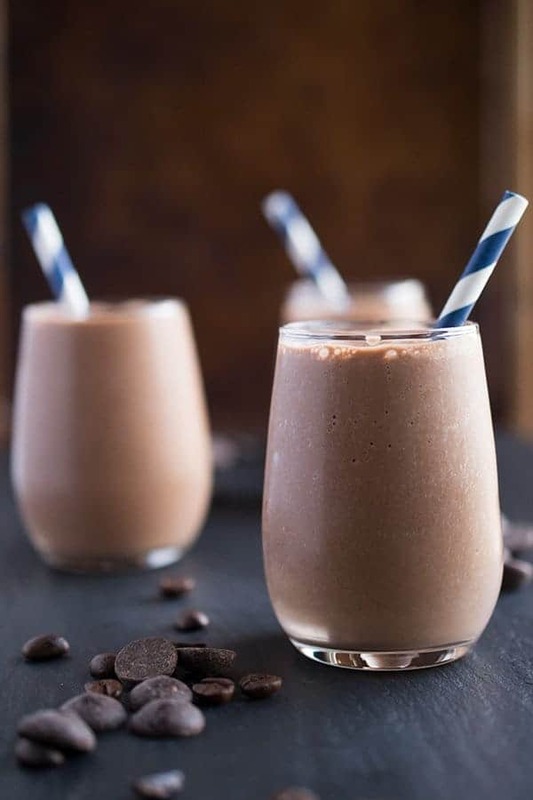 Frothy chocolate and coffee perfection - this healthy knock-off of the Starbucks mocha frappuccino has all the flavor, none of the guilt. 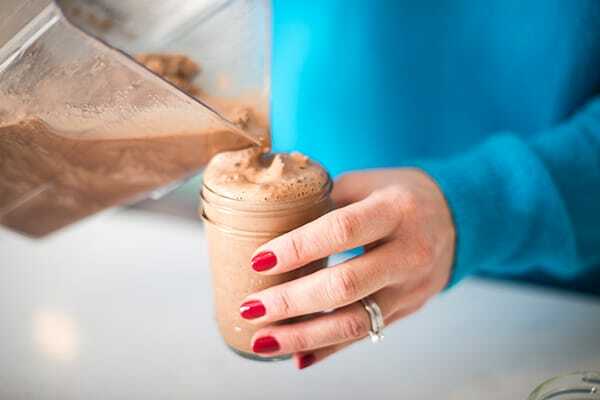 Combine coffee, half and half, cocoa powder, vanilla, stevia and salt in a blender. Puree until smooth about 30-60 seconds. 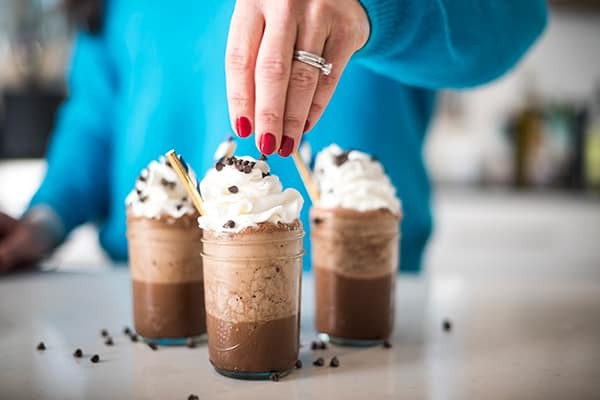 Pour into a glass and garnish with whipped cream and dark chocolate shavings. For a thicker consistency, add more ice. Stevia has no calories so if you swap with honey or another sweetener please note that the calorie total will increase a bit. Want more delicious drink recipes? Check out my Pinterest board! Such an easy & tasty recipe! Thank you for sharing this. Is there a way to make this a cherry mocha frapp? Maybe just add some kind of sugar free cherry flavor? How about you add frozen pitted cherries? Hi! Great recipe. Any idea on how many shots of espresso to use in place of the cooled coffee? I would do one shot per serving! The coffee ice cubes idea is brilliant!! I want to try that! What does Stevia taste like?? Is it bitter? It depends on the brand but the one I link to (that I use and love) is NOT bitter at all! This looks yummy!! I notice that on the recipe that the whipped cream and chocolate shavings are optional. 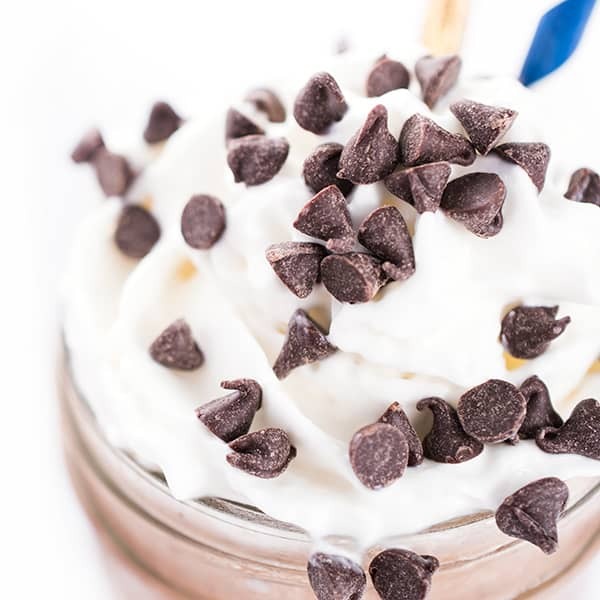 Are the whipped cream and chocolate shavings included in the 72 calories, or should I add the calories for the whipped cream and chocolate shavings on top of the 72 calories? I’d love it if you would answer my question. 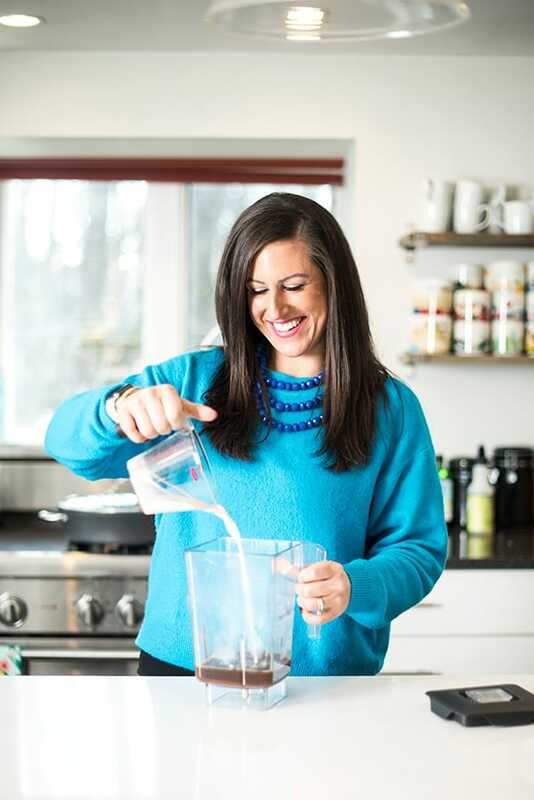 Hi Patti – I would start out with one or two tablespoons then add more to taste. I don’t like my drinks overly sweet so it certainly varies to taste. :) Let me know what you think!! Oh yes! I definitely needed this recipe :) coffee addict over here! Liz I love this a million times over. I always get light frapps at Starbucks, but I still feel guilty – I have to give yours a try! This was delicious! I’ve been making an iced mocha version for a while, but I loved this blended version (the vanilla was a superb addition). I used whole milk instead of half and half and 1/2 tbsp of sugar. I think the key is using good cocoa powder – I use extra dark cocoa powder from Amazon. My only problem was that the drink kept separating (the drink and the ice) – any tips on having that not happen? Thanks for the recipe! Oh I’m so glad you loved it!! The vanilla really is a great complement to the cocoa and I agree with you on high quality cocoa. If you’re looking for the drink to keep from separating, one tip is to add a pinch of xanthan gum. It’s a bit pricey so I rarely have it on hand but if you’re looking for the drink to keep from separating I’ve read it works well! I’ve also heard of people using powdered pectin – the stuff used when making jams or jellies. I hope that’s helpful! Glad you made this over as I had a number of the ones at Starbucks and they are to die for! Literally…. too many of those in life and I would die from a fat attack! I hope you enjoy my version! Have you tried this with fat-free half-and-half, Liz? That would make it even healthier–but would the texture and taste be the same? Thanks for the prompt reply, Liz, and education! I will read my labels carefully before buying fat-free in the future! And 1/4 cup of half and half, for 2 servings, is not much fat. Besides, we all need a little fat in our diets. Love this Liz!!! I am with you on having certain “off limits” foods. It’s shocking how many (empty!) calories the Starbucks version has! I know…it’s a little scary, especially how much we pay for it! thanks ! This sounds yummy!! I have to confess that I go to Starbucks regularly. Im actually sitting in one right now !! My fav is Grande light coffee frappuccino w sugar free hazelnut (or vanilla or caramel syrup. Its under 200 cals and artificial sweetener be damned. lol! I love this, tastes great & lets me think im having a high calorie ice cream treat !!! It does get a bit pricey so will have to make your version for a lot less money !!! Trust me – I totally get it Bonnie!! Enjoy! I remember the fat-free food my parents ate in the 80s. Remember Snackwells? Disgusting! YES! I always joke about Snackwells!!!! So creepy. :) Thank you! One word – THANK YOU. I could spend a fortune on these things. Oh YUM! I have everything to make this, including a chocolate honey. Liz, you never cease to amaze me with your better versions of decadent recipes! Wow chocolate honey sounds PERFECT Angela!! Enjoy!! My go-to summer coffee drink is an iced nonfat latte, but this healthy frap would be fantastic for a change-up. 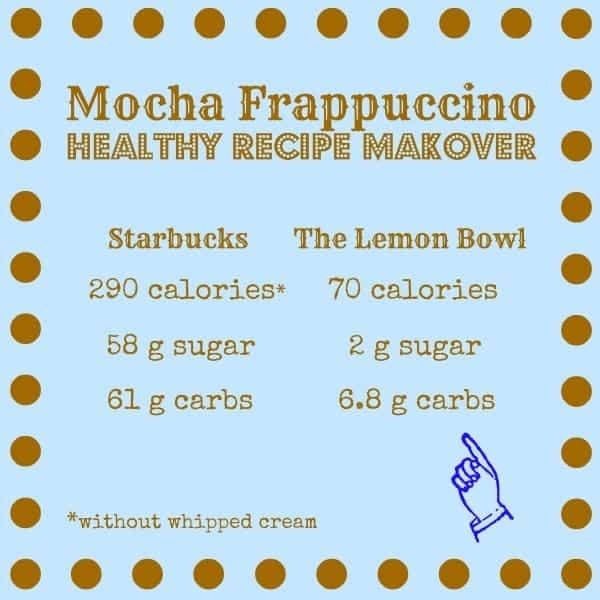 Do you happen to know the calorie / sugar / carb count in a Venti low fat, sugar free mocha frappacino from Starbucks? I just put another $25 on my Starbucks app and drink at least one if these a day. Dying to try your recipe. Hi Kathy – I’m afraid I don’t but I bet you could out at Starbucks.com! mm mm mm When I was in college I drank Starbucks every single day and then I got a job there and probably drank it 2-3 times a day. I will admit that I LOVE Starbucks, but making them at home (and ones that are better for me) would be 100% better! I always secretly wanted to work at Starbucks – that’s so cool!!! How are you SO BRILLIANT? :-) this is a great idea. You rock, Liz! You made my morning! I love Mocha Frappuccinos in the summer, but they are way too expensive and unhealthy to drink everyday. 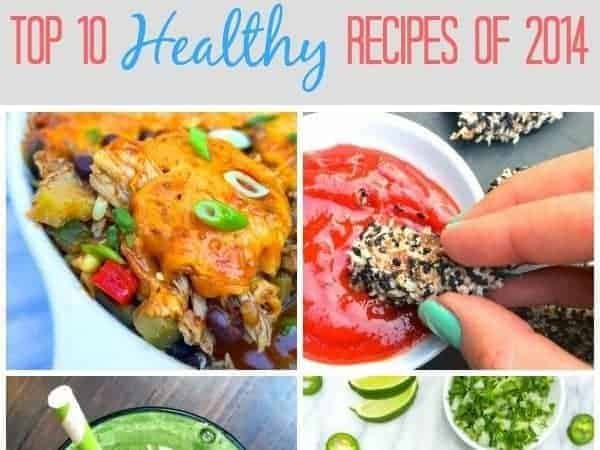 I can’t wait to try your healthy homemade version! I know – they are so pricey and I love the idea of being able to make them at home! I love this lighter version!! I honestly never get these fancy drinks because of the calories. I must try this!! Liz, I love this. Every time I walk into a starbucks (which is rare, but still) I stand there at look longingly at the Frap board, then remind myself I’d rather have a milkshake…and that $6 the frap would set me back. So excited to see this recipe–my wallet (and my waistline) thank you! I know – the light drinks are tempting but often that means they are made with even more chemicals/artificial sweeteners. I hope you enjoy this version!! I feel the same way!! I remember in college I would get caramel macchiatos all the time. Now that I’ve lost the weight I just can’t go there mentally. The stevia drops are a life saver!! You can buy them all on amazon (link in the recipe) if you don’t have a store near you that sells them. That’s usually what I do since I hate shopping with the little one – hahah.